Government bureaucracies and their proxies, especially those dealing with environmental issues, are known for a pedantic adherence to the rules. When those folks run headlong into Apple and its equally bullheaded emphasis on design for design’s sake, there is bound to be conflict. Due to design changes wrought in the Retina MacBook Pro, Apple has dropped its long-ballyhooed adherence to EPEAT (Electronic Product Environmental Assessment Tool) standards and, thereby, has lost the federal government as a customer. iFixIt’s Kyle Wiens has an axe to grind with Apple over how hard it is to take apart, let alone repair their products. And, the difficulty has increased with Cupertino’s latest design innovation, the MacBook Pro with Retina display, which Wiens says is “very difficult to repair,” which might actually be something of an understatement. But that’s just the beginning of a very sticky story, sticky in that peculiarly Apple way. Previously, all Macintosh computers were EPEAT certified, meaning they met government sanctioned standards for ease of disassembly, repair and recycling. 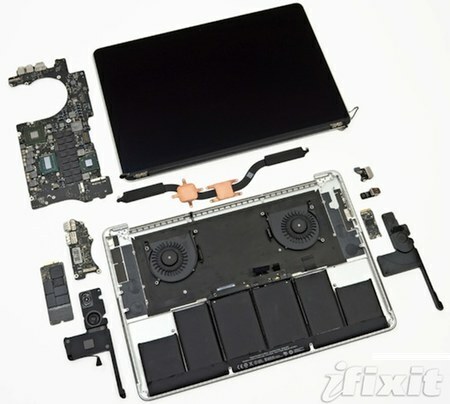 Apple’s new MacBook Pro with Retina display is manufactured with the display components glued to the portable’s Aluminum frame as are the batteries. As Wiens notes, taking the thing apart without damaging the components is nigh impossible. So, rather than get rejected by EPEAT testers, Apple didn’t send the MBP Retina or any of its other recently updated portables for certification. In fact, Cupertino asked EPEAT to remove all 39 previously certified desktop computers, monitors and laptops from its listings — boom. Robert Frisbee, CEO of EPEAT, told the Wall Street Journal that Apple made the demand late last month without preamble or any attempt to negotiate. Now, before you get your 100 percent post-consumer waste recycled knickers in a royal twist, know this: Apple’s take back and product recycling goal for 2012 through 2015 is 70 percent of products sold (by weight), a goal the company has exceeded for the last two years. EPEAT or not, Macs will get taken back and recycled. So, when iFixIt’s Wiens says, “Apple’s decision to opt out of the most basic of eco-standards demonstrates that, despite the costs, design supersedes the environment,” you really should dismiss his hyperbole out of hand. Moreover, in an age when an oil change can require a trained technician using purpose-built equipment, you have to wonder what value EPEAT standards, especially when they seem to be cut in stone, really have?